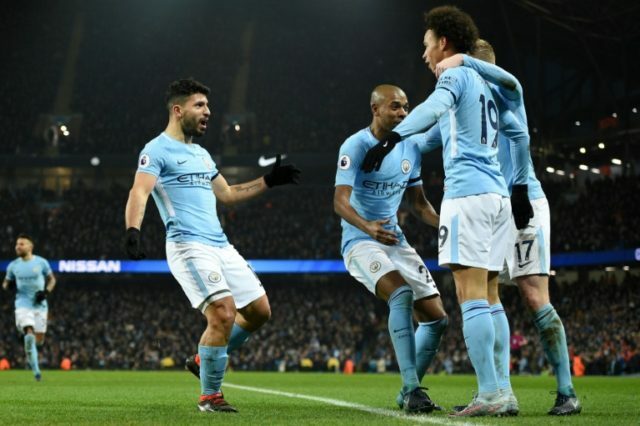 Manchester (United Kingdom) (AFP) – It was back to thrilling business as usual for Manchester City on Saturday as Sergio Aguero’s hat-trick helped the Premier League leaders to a 3-1 victory over abject Newcastle United at the Etihad Stadium. Pep Guardiola demanded a response from his table-toppers following the 4-3 loss to Liverpool last Sunday that ended their unbeaten start to the league season. The City manager got just that as the hosts dominated, despite Newcastle making it interesting for a while in the second half thanks to Jacob Murphy’s fine finish. City are again 12 points clear of second-placed Manchester United thanks to a ruthless performance capped by the brilliant Aguero, their all-time leading scorer, whose 11th hat-trick for the club took his tally for the season to 22 goals. Newcastle’s supporters must look at City and wonder how close they are to getting their own rich new owners after a week in which a potential takeover of the club by British businesswoman Amanda Staveley was branded “frustrating and a complete waste of time” by owner Mike Ashley. With Newcastle suffering from a lack of investment and hovering at the wrong end of the table, this contest was never going to be a comfortable one for Rafa Benitez’s visitors, especially as the gifted David Silva returned for City after overcoming a stomach complaint. Yet Newcastle still looked sharper at the start as Christian Atsu snatched at a great chance just 90 seconds in,failing to connect properly when well positioned on the penalty spot. City then began to dictate the match and John Stones went close for the hosts, poking just wide after an intelligent ball from Silva inside the area. City remained on top, with Silva, Oleksandr Zinchenko and Kevin De Bruyne posing problems for Newcastle. After 16 minutes, Leroy Sane had a glorious chance to open the scoring as he squirmed through the area before Javier Manquillo’s last-ditch tackle. A minute later, City were denied what seemed a good goal as Raheem Sterling swept home following a ball from Silva at the back post. But Sterling was adjudged to be offside, although replays suggested he was not. The speed with which City, and Silva, had broken was ominous for Newcastle. To their credit, Newcastle kept the game scoreless until they succumbed 11 minutes before the break. As City continued to pour forward, De Bruyne delivered a fine cross from the left and Aguero got the faintest of touches to a header that slid past Karl Darlow into the far corner. The second half followed the same pattern, with City repeatedly on the attack and any hopes Newcastle had of earning a point seemed to evaporate when Manquillo hauled down Sterling in the 63rd minute. Aguero blasted the ensuing penalty past Darlow to double City’s advantage. Yet, almost immediately, City were caught napping at the back and Murphy raced through on goal and lifted the ball over Ederson to halve the deficit. Newcastle’s spirits were raised further by Darlow’s extraordinary reflex save from Sterling and, all of a sudden, the Magpies were revitalised as Mohamed Diame twice tested Ederson from close range. However, with seven minutes remaining, City secured the three points — and settled their nerves — when Sane went on a mazy 30-yard run that sucked in most of Newcastle’s defence before he squared into the middle of the box where Aguero calmly completed his latest treble.